Best Grills for Boats: Summertime Fun Ahead! Instead of waiting to get back to land, you can now grill from the comfort of your boat. Whether you're out for a leisurely boat ride or fishing, you have the option to enjoy fresh-cooked food. To help you find the right grill, we have come up with a list of the best grills for boats. Here's our picks so far! The best solution for grilling on your boat is this Cuisinart grill that is specifically designed for boat use. This grill comes with a mounting bracket and can mount to a 1.25-inch pontoon boat railing. You won’t need any tools to secure the bracket onto the boat railing. The brackets come installed in the box with the grill, so all you’ll have to do is attach it to the railing. This grill was customized to work with Arnall’s Grill brackets. The Cuisinart Petite grill offers about 145-square inches of cooking surface, which is a reasonable amount. Luckily, the grill starts up fast and stays hot no matter how much wind is around, so you can expect consistent use when you’re cooking for everyone. Cleaning will be a breeze with this grill as well. Why is this the best option for you and your boat? It is already set up for on-boat use. The grill just needs to be connected to the boat railing. With minimal setup, you can start grilling on the water. The Magma Marine Kettle gas grill is another great option for grilling on your boat. You can choose from two sizes – 15 and 17-inches. This will give you more options, depending on the size of your boat. The hinged lid is sturdy, so it won’t close shut every two seconds if there is a high gust of wind in your area. You can easily attach the propane tank and start cooking next to the water. One possible issue with this grill is that the mounting bracket is not included. This means that you need to purchase the bracket separately for the grill to be fully functional on your boat. Another problem people found was that while the grill itself has the potential to last long, it is made with material that is bound to rust from exposure to salt-filled ocean water. The Magma brand uses 304-steel with its products; a low-cost material. That is why it is very important to clean this grill often if you want it to last. While the Smoke Hollow 205 isn’t specifically engineered for boating use, it’s size and gas power will serve you better than you would expect. This grill has a generous cooking surface of 305-square inches. You’ll likely be using a small propane canister to power the grill. The Smoke Hollow brand has transformed the market by offering a method where the gas can be used for longer periods of time without running out, which gives you more bang for your buck. While a small propane tank should suffice, you can add a larger tank. To connect a larger propane unit, you’ll need to buy an adapter separately. The grill offers even heating, which will help ensure that your food is properly cooked. There is also a temperature gauge located on the lid. It should be noted that this is not the most durable grill. With regular use and exposure to water, the outer surface could rust. Some people have had issues with the ignition button; you may need to press the button several times to start up the grill, but once you start it up the grills works fine. 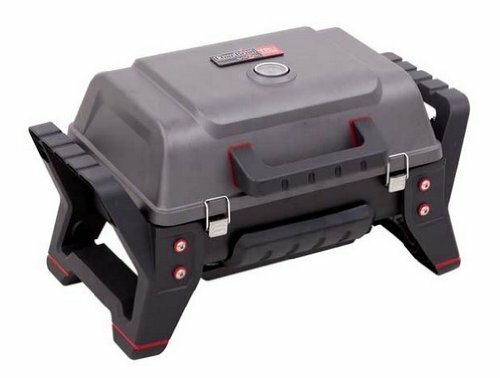 The Char-Broil TRU-Infrared gas grill ranks high for portability and durability. It resembles a toolbox, which is fitting considering the sturdy design. With the infrared powered setup, you’ll be able to heat up the grill quickly, while cooking all your chicken, burgers, steaks, ribs, and hot dogs evenly. 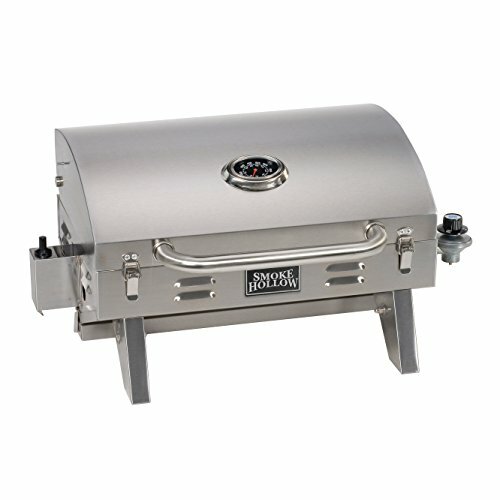 The best part about this grill is that it doesn’t use a lot of propane with each use, so you’ll save money by purchasing a lower quantity of propane canisters. Since this grill was designed to be a portable tabletop grill, you unfortunately won’t be able to mount it onto your boat. While it doesn't mount, you can place it on a flat surface on your boat. The wide base will keep it from sliding around or tipping over. Even without a mount, the durability and price of the grill keep it in competition with other boat grills on the list. With two lockable latches on the front of the unit, you’ll be able to secure the grill and keep it from accidentally opening. Another benefit is the easy-start ignition. You shouldn't have trouble starting the grill. Another boating grill from Magma, the A10-803 Connoisseur grill can be an alternative if you haven’t found the right fit for you yet. The large surface area of this grill can cook for a large group. Like the other Magma grill, you will encounter issues with rusting using the A10-803 Connoisseur grill. The material used for Magma grills rust easily, especially if its regularly exposed to salt water. This grill is easy to clean, especially thanks to the grease trap system. This system can last for an extended period if it’s maintained, so make sure to clean it when you’re done grilling. 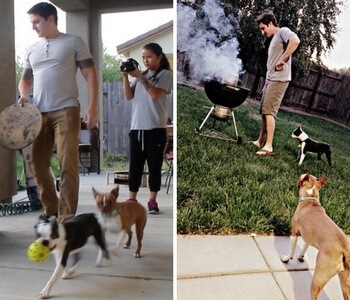 The fold-away legs make this grill easy to store. While the mounting brackets are sold separately, they will keep the grill from moving around. Choosing the best grill for your boat may depend on your preferences and the size of your boat. No matter what brand you go with, the grill should fit comfortably in your boat – either on a flat surface or mounted to a pole. You'll also need to consider the fuel source, along with the pros and cons of each option. Grills with long lasting fuel, such as the Cuisinart Petite, the Char-Broil TRU- Infrared grill, and the Smoke Hollow 205 will emit a reasonable amount of gas without running out too soon. Having enough fuel to cook with is very important, because the last thing you want to do is keep going back and forth to shore because you need to buy more propane gas. These grills are known to last long, even when using a small cylinder of propane. You also need to decide if durability is an issue. You can save money and find cheaper grills if you're willing to sacrifice quality. 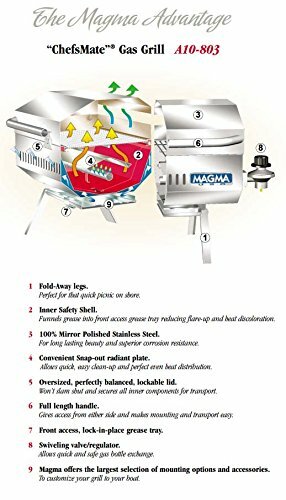 The two Magma grills on the list are great at grilling on the boat, but they are made of cheaper materials. These grills are more likely to rust out in comparison to the other 3 products on the list. The boat grill that will handle the seawater the best is undoubtedly the Cuisinart boat grill. On top of that, this grill already comes set up, so if you don’t like building things with your hands, you might want to check this grill out. Space is important when you’re on the water, especially if you are with other people. The last thing you will want is a grill for your boat that takes up an unreasonable amount of space. The grills that have mounting brackets won’t take up too much space. Though, the ones with legs are also relatively small. One of the most desirable parts of having a grill for a boat is that you don’t have to settle for cold food, but what distinguishes a boating grill from any other type of grill? A grill that you can use on a boat isn’t necessarily a grill that is used strictly for boats. 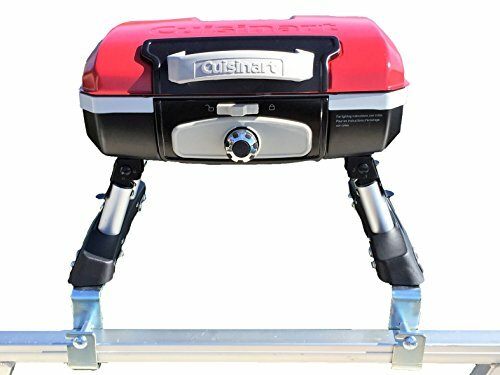 Most of the time, you can find a reliable portable grill that can be attached to the boat using a mounting bracket. Grilling on a boat brings a few potential issues that you don't need to deal with on land. When you're out in the water, your grill may get wet. A few drops will not damage the grill, but regularly exposure to water can increase the risk of rusting. This is especially true with salt water. If you don't want to spend the money on a durable grill, it may be worth it to get a normal portable grill and replace it regularly as parts start to rust. When it’s time to make a purchase, you’ll have to consider the size of your boat, along with durability, price, fuel source, and cooking area of each grill. A big issue you might run into is wind. If intense winds don’t put out your flame, they could cause a flare up and/or potential grease fire, which wouldn’t be good for anyone on the boat. For this reason, you should bring a fire extinguisher with you. If you plan for safety, you can relax and enjoy grilling out on the water! 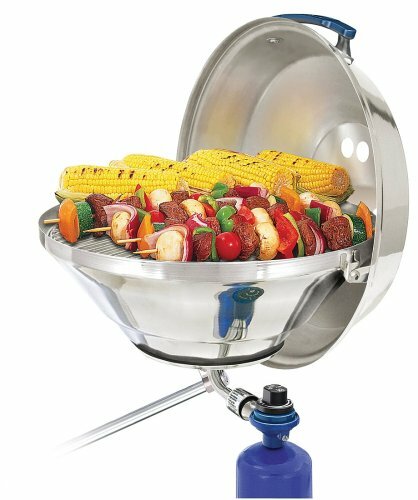 You are here: Home / Outdoor Cooking / Best Grills for Boats: Summertime Fun Ahead!